An unidentified flying object or “UFO” is an object observed in the sky that is not readily identified. 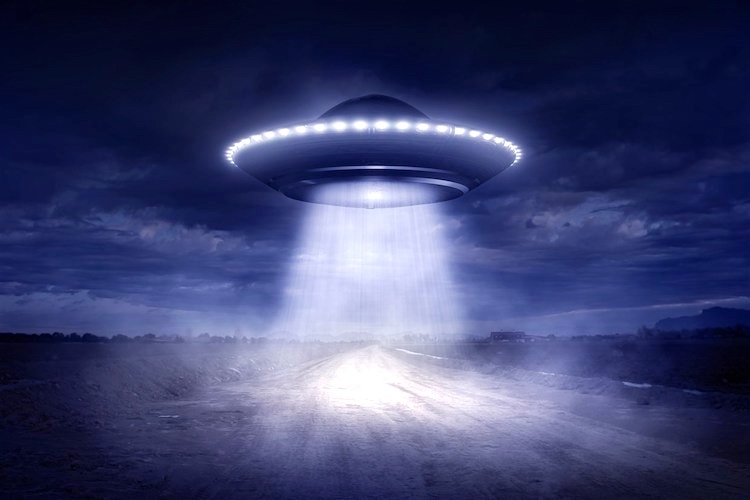 Most UFOs are later identified as conventional objects or phenomena. The term is widely used for claimed observations of extraterrestrial craft. World UFO Day is an awareness day for people to gather together and watch the skies for unidentified flying objects. The day is celebrated by some on June 24, and others on July 2. June 24 is the date [in 1947] that aviator Kenneth Arnold reported what is generally considered to be the first widely reported unidentified flying object sighting in the United States, while July 2 commemorates the supposed UFO crash in the 1947 Roswell [NM] UFO Incident. In these entries, you can see two shifts in the semantics of the lexical item UFO. It starts as an initialism, an abbreviation for the expression unidentified flying object, with the meaning (just above) of the longer expression. That’s UFO-a. Initialisms are lexical items with lives of their own: they have their own morphology and syntax; they are sometimes orphaned (the longer expression drops out of use, while the initialism continues in use); and they very often drift semantically, away from their original meaning. As when UFO “is widely used for claimed observations of extraterrestrial craft” (from the Wikipedia entry above). That’s UFO-b ‘flying object claimed to be an extraterrestrial craft’; the item has picked up additional semantic content, from being frequently used in contexts where UFO-a’s were claimed to have extraterrestrial origin. Then in the Wikipedia entry on the holiday, we get a further development, in “the undoubted existence of UFOs”: the term is now even more specific, through the elevation of a claim of extraterrestriality to certainty about the origin of the craft. This is UFO-c ‘flying object that is an extraterrestrial craft’. No one doubts the existence of UFO-a’s. There have been many sightings of flying objects that at first failed to have their source identified, and some number have never been fully explained, though many people believe that their origins are like the origins of the ones that have been explained. And no one doubts the existence of UFO-b’s. There are a fair number of sightings of flying objects that have been claimed to be of extraterrestrial origin. But plenty of people doubt the existence of UFO-c’s, doubt that there are flying objects of extraterrestrial origin. Clearly, one bit of the Wikipedia article — “the undoubted existence of UFOs” — was written by a True Believer. Especially the last, since its action is crucially linked to U.S. Independence Day, July 4th. This entry was posted on July 3, 2018 at 1:08 pm and is filed under Abbreviation, Holidays, Initialisms, Lexical semantics, Movies and tv, Pragmatics. You can follow any responses to this entry through the RSS 2.0 feed. You can leave a response, or trackback from your own site.